Tim from southwestern England is riding from Boston, Massachusetts to San Francisco, California, "just for fun and adventure." He stopped by the Century Cycles store in Peninsula on Aug. 28 to get directions to the nearest campground. As a reminder, all three of our stores are CLOSED today, September 3, in observance of the Labor Day holiday. Here's hoping that you're out on your bicycle today for fun and adventure! 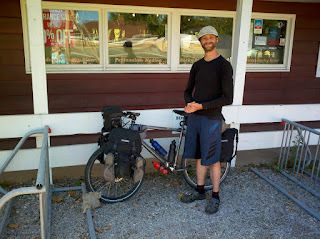 For more pictures of long-distance cyclists who have visited our stores, check out our Bicycle Touring Photo Gallery. Tech Talk: Help! My seat keeps slipping! Follow us (virtually) to InterBike! We need your, er, SUPPORT!